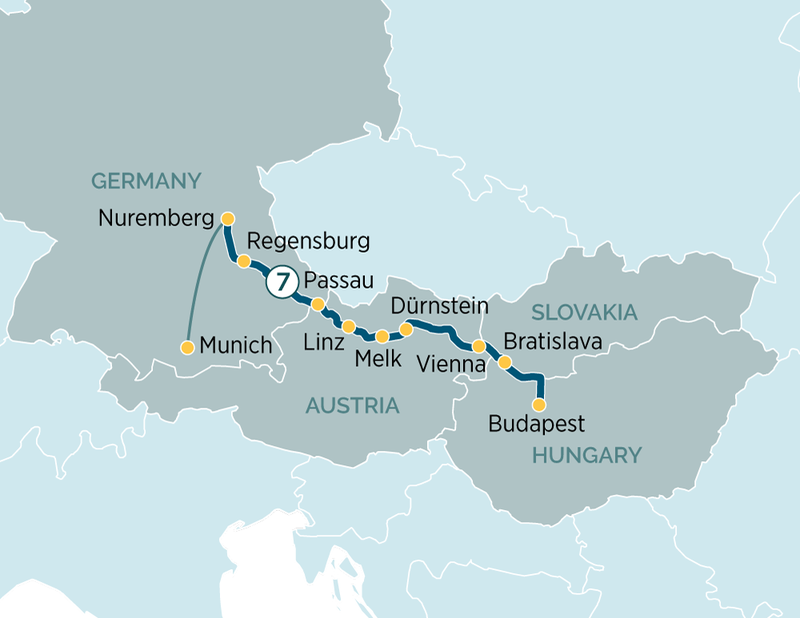 From Bavaria to Budapest, join us for an 8-day river cruise on the River Danube. Travelling from Munich to the exquisite capital of Hungary, you’ll uncover the wonders of this majestic European river. Follow the weaving flow of the Danube between the southern German state of Bavaria to Budapest, a city of immense cultural contrast. Your journey begins on the famous Main-Danube Canal, where you’ll savour a warm Germanic welcome courtesy of a traditional Bavarian band. Crossing the border into Austria, visit beautiful Passau and join an enriching walking tour, taking in such sights as Oberhaus Fortress and St Stephen’s Cathedral, home to the largest church organ in Europe. Cruising through the dramatic Wachau Valley, cycle the Danube from Melk to Durnstein on an EmeraldACTIVE excursion, or take a hiking tour of Durnstein Castle. Vienna is the next stop, and here you can explore famous sights like the Opera House, Burgtheater, Spanish Riding School, and Hofburg Imperial Palace. The Slovakian capital of Bratislava highlights the cultural complexity of the region, with Celtic, Slavic, and Roman architecture on display across the city. Budapest is your final call, and here you can experience a traditional Hungarian folk show and evening cruise, or an invigorating guided hike to the summit of Buda Hill.